Across the country, Tigo continues to perform best for the fastest average download speeds on 4G. Claro, which took the 3G lead, has also improved upload speeds since our last report for Colombia and performs best for network stability. Across Colombia, Tigo continues to record the fastest average download speeds on 4G, improving its average result from 10.06 Mbps in our 2018 Market Snapshot to 10.51 Mbps. Claro has also improved its average download speed score, moving ahead of Movistar, with an average result of 9.65 Mbps on 4G between December and February. Movistar drops to third across the country, but moves ahead of Claro in Valle del Cauca where it averaged download speeds of 10.73 Mbps. On 4G, Claro inches ahead of Tigo to claim our top spot for the fastest upload speeds, averaging 5.62 Mbps. Tigo average 5.50 Mbps on 4G across the country, but did perform best for 3G upload speeds and improved its 4G speeds in Valle del Cauca to an average of 6.52 Mbps across the three months, taking the lead away from Claro. With the lowest average jitter and relatively low packet loss of the three operators in Colombia, Claro performs best for 4G network stability in our latest mobile experience report for the country. 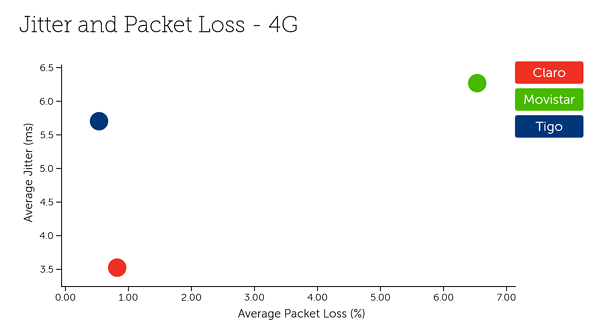 Tigo demonstrated the lowest average packet loss of the group, but was let down by its relatively high jitter. Movistar, which placed third for the majority of tests, recorded the highest jitter and packet loss across the country. Our findings for Colombia are based on 30.5 billion network quality measurements including 5.44 million speed tests between December 2018 and February 2019. Our latest complimentary Mobile Experience Report is available to download from the Tutela Insights portal.